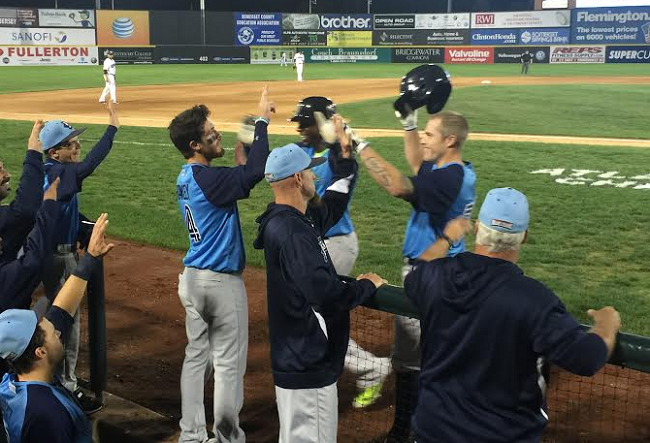 The Southern Maryland Blue Crabs opened the 2015 Atlantic League Championship Series with a 7-3 win over the Somerset Patriots at TD Bank Ballpark on Wednesday evening. The game was scoreless until the fourth inning when Southern Maryland got on the board on a Zach Wilson RBI single. Somerset immediately answered with two runs in the bottom half of the inning on a home run by David Vidal (1) to make the score 2-1. Vidal made the start after an injury in Game Four of the Liberty Division Series threatened his availability for the championship round. “It felt good to be out there and trying to help the team win. It didn’t go as we planned tonight, but we still have a couple games left,” Vidal said. The lead was short-lived as the Blue Crabs scored four runs off Somerset starter Mickey Storey (0-1) in the top of the fifth inning, highlighted by a three-run home run by Fred Lewis (1). “Mickey looked really good in the first three innings, but then they made adjustments as a team. They were no longer off-balance and were taking good swings and everything happened pretty quickly. It seemed like he lost control at that point and gave up the big home run that we were able to avoid last series,” said Somerset Patriots manager Brett Jodie. Storey ended his night with five runs on seven hits and four strikeouts in 5.1 innings pitched. “I thought I started off strong. I think they just started to get to me early. They didn’t get deep into counts and they kind of jumped on me with their approach. They strung some hits together and then the big home run. Can’t have that. It was multi-runs scored on that and it put the team behind,” said Storey. Blue Crabs starter Daryl Thompson (2-0) seemed in control through 7.2 innings of work before Somerset’s hot-hitting right fielder Michael Burgess came up and hammered his third home run of the post-season to cut the deficit to 5-3. “He kept us off-balance and we really couldn’t get to him like we wanted to get to him. I guess I just stuck to the approach that I should have had the whole game. I wasn’t staying on pitches today. I ended up staying on that one and getting him,” Burgess said. The Patriots seemed right back in the game until Southern Maryland answered again with a two-run home run by Wilson (1) in the ninth for the 7-3 final. The 2015 Atlantic League Championship Series will continue on Thursday night with Game 2 at TD Bank Ballpark at 7:05 pm. For more information, or to purchase tickets, visit www.somersetpatriots.com.